You'll be £14.99 closer to your next £10.00 credit when you purchase Tracing Your Canal Ancestors. What's this? Britain's industrial revolution depended on canals for the cheap movement of materials and goods – until the coming of the railways. Canal companies struggled to compete and went into a long decline, but much of the canal network is still with us today, and interest in the history and heritage of canals - and those who worked on them - is strong. That is why Sue Wilkes's well researched and highly readable handbook on the subject is so valuable. She concentrates on the people who lived and worked on the waterways – the canal boatmen, their families and their way of life - and those who depended on the canal trade for a living – the lock-keepers, toll collectors, and canal company clerks. She provides a thorough, practical guide to the sources – the archives, books, websites, societies – available for researchers if they are studying our inland waterways, or trying to find out about an ancestor who worked on the canals or was connected with them. Her book is essential reading for anyone interested in this aspect of the industrial past. A very readable book and a practical and down to earth guide. Those with canal ancestors have a harder time than most of us in finding births, deaths and marriages, let alone other facts. This book will go a long way towards helping research those very mobile ancestors. Many useful sources of further information are listed. Sue Wilkes explains how to research canal boatmen, navvies and their families and examines Britain’s future unique waterways heritage. This is an excellent practical guide from an established expert on our industrial heritage and a well-known family historian, Sue Wilkes. Catering for both beginners and more developed family historians, the book is essential reading for anyone interested in this aspect of the industrial past. This is an extremely useful, interesting and well written book which should be in the collection of anyone interested in workers on Britain's waterways.. This is a commercial and social history of the people who lived and worked on the waterways..
A thorough and practical guide. Tracing your Canal Ancestors is a practical guide that aims to help people with ancestors who worked on the canals, or for a canal company, to explore these roots. 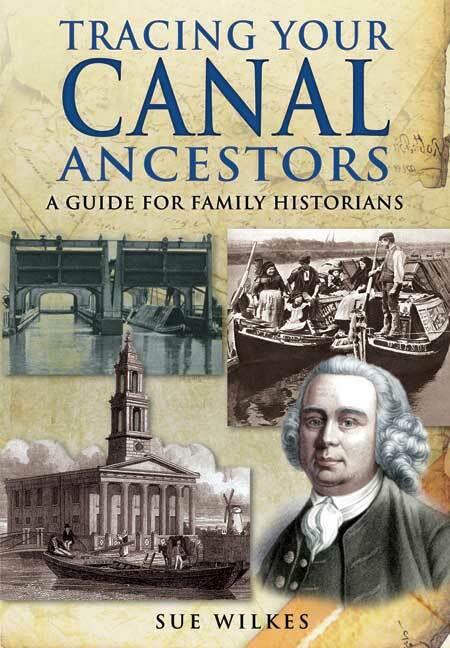 Read it for a useful guide to canal-related ancestry research. This is the practical guide that aims to help people with an ancestor who worked on the canals or for a canal company. Split into two parts, the first section explored the story of Britian’s canal carrying trade and the social history of its workers. The second section explains how to take a research further, and the book caters for both engineers and more experienced researchers. It also gives a practical guide to sources, including archives, books, websites and societies. Britain’s industrial revolution depended on canals for the cheap movement of materials and goods- until the coming of railways. Canal companies struggled to compete and went into a long decline, but much of the canal network is still with us today, and interest in the history and heritage of canals- and those who worked on them- is strong. That is why Sue Wilkes’s well- researched and highly readable handbook on the subject is so valuable. She provides a thorough, practical guide to the sources- the archives, books, websites, societies – available for researchers if they are studying our inland waterways, or trying to find out about an ancestor who worked on the canals or was connected with them. Her book is essential reading for anyone interested in this aspect of the industrial past. equally superb offering on a completely different theme – the canal heritage of the British Isles. The book is in two main parts – the first detailing the history and the second how to uncover it using key resources and archives. Whether you do or do not have a connection to the waterways, this work is an absorbing and enlightening read. The book is well written in a lively style, the information is comprehensive and more than enough to give a researcher a good start in their quest for a canal ancestor… It is well researched with photographs, contemporary drawings, maps and copies of relevant documents that a researcher may encounter. The illustrations are a significant strength of the book. A comprehensive introduction to the history of canal and inland waterway workers. This practical guide shows how to trace canal boatmen and their families, explains the workings of the canal network and identifies key sources for family historians. Sue Wilkes concentrates on the people who lived and worked on the waterways – the canal boatmen, their families and way of life – and those dependent on the canal trade for a living – the lock-keepers, toll collectors, and canal company clerks. Her book is essential reading for anyone interested in this aspect of the industrial past. “The first half of this volume offers a clear, atmospheric history of canals and the people who built and worked them. The second section of the book guides readers through the various records and repositories that may include details about canal ancestors. Social historian Sue Wilkes’ new book, Tracing your Canal Ancestors, is an authoritative guide for those with connections to Britain’s waterways. A mixture of socio-industrial history with clear advice on how to find out more about ancestors who played a part in British canal history, Sue Wilkes’ book will be an invaluable addition to many family historians’ bookshelves. This guide is not just for those with canal boatmen in their trees – it also provides often overlooked information on people who relied on the canal trade for a living, such as lock-keepers, toll collectors and canal company clerks. The book is an excellent manual for family historians and comes with lots of ideas about where to find further information about the personal lives of those that worked the waterways.